Hey, Trunade! Is the second-coming of Giant Trunade, but not as good. Easy to use: activate it to return all set spell/traps to the hand. 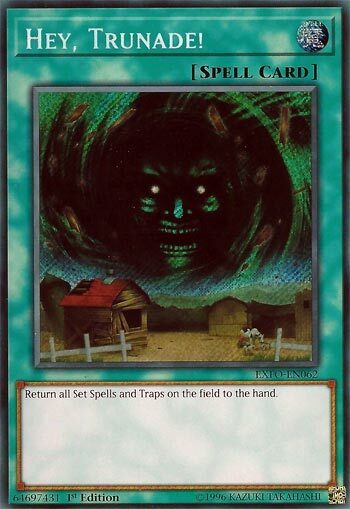 Problem is, against Pendulum cards, Field Spells, and Continuous Spell/Trap cards this card is useless. Nowadays there are so many cards that are useful face-up in the spell/trap zone. It’s a good card, don’t get me wrong. I would use it, I don’t mind blowing back my opponents set spell/trap cards until they are set again next turn, the blowback from Hey, Trunade! on your turn can be a winning play, and for free nonetheless. I think too many players are looking at this card as too much of an incomplete card rather than its true potential. You can play this in 3’s for the moment, c’mon! Hey, Trunade! is a free Normal Spell Card that returns all Set Spells or Traps to the hand. That’s it. The name is bad. The art is lazy. The effect is ok. Own three if Artifacts become important again. Miss Giant Trunade? Yeah, me neither. Thankfully Konami didn’t try to bring that back and instead gave us a new card… Hey, Trunade! Hey, Trunade! is a simple Spell that bounces all set Spells/Traps back to the hand. So we keep a part of Giant Trunade that makes it good, but got rid of the part that was the problem. That is basically what this card is. With cards like Bottomless Trap Hole and Torrential Tribute back at three as well as Solemn Judgment being back at one, this card can be more useful in getting rid of backrow. Solemn Strike and Warning are alone worth getting rid of. Sure we got tons of backrow removal, but if you play against a very heavy backrow deck, this card might be worth a Side Deck option. Otherwise, I am sure Cosmic Cyclone, MST, or Twin Twisters will suffice for you. They couldn’t do better then Hey Trunade! really? Short and sweet here friends. Where Giant retuned ALL Magic and Trap cards to the owners’ respective Hands, this just returns the Set ones. It’s honestly a headache to be how much the M//T removal factor in this game has gone, and equally more so that a good chunk of them are actually solid, usable cards. The best part here, at least to me, is that this is more of a mass removal then some of the options played right now. User discretion right now, if this works better for you, or you need extra removal against more aggressive back row players, use this. At first, I thought this was some sort of name change of Giant Trunade (like Kinetic Soldier into Cipher Soldier). The artwork is very similar. The original Trunade had too much potential for abuse. However, this one prevents this only returning face-down spells/traps. So, it is is a tool to help offensive pushes but the aspect of it being able to recycle face-up spell/trap cards is gone. Initially, this wasn’t too much of a problem because there were only a few good targets. However, from Pendulums onward, many powerful face-up spell cards came out and Giant Trunade was basically a reset button. This new Trunade still allows for OTK potential (or at least an offensive push). However, it is now also a -1.